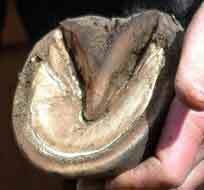 Due to the damage that horseshoes cause to the equine hoof, even with timely resets, many thousands of horse owners since 2000 have removed the shoes from their horses and learned to trim the hooves in a way that keeps the horse sound. The barefoot trim is frequently and successfully used to rehabilitate foundered and "navicular" horses, as well as to get hooves in top condition for endurance racing and other demanding equine sports. Instructions for a natural, "wild horse" type of barefoot trim. March 2017: I have completely retired from hoof trimming, and am traveling around the USA visiting family and friends. My name is Marjorie Smith. I trimmed my horses' feet myself from 1998 to 2013, and taught locally. Since May 2013 I no longer have my own horse. I am focusing on climate change for the rest of my life, so I am cutting back on barefoot consultations. I will answer short general questions. My NEW email address is: mbarefoothorse@gmail.com. For longer questions and for photo consultations, please contact Heike (HIKE-a) Bean: heikeb@fairpoint.net. There is good advice available at groups.yahoo.com /group/barefoothorsecare which is hosted by my friend Walt Friedrich, and at "Hoof Help Online" at The Horses Hoof. www.tribeequus.com. Click "Natural Horse Resources," then click "Hoof Care Providers." The Horses Hoof. Click "Trimmers List" and "Friends List." www. AANHCP.net. Click "Locate an AANHCP Practitioner." United Horsemanship. Click "Hoof Grooms." www.EquinePodiatry.net. Click "About Us", then click "Equine Podiatrist Area Listings." www. uknhcp.org. The UK affiliate of AANHCP. www. epauk.com The UK affiliate of Equine Podiatry. www.abchoofcare.com Oregon School of Natural Hoof Care. www.liberatedhorsemanship.com Liberated Horsemanship. Many courses, with an annual one in Spain. -- entirely covered by a tough outside layer (wall and sole) to protect the inside from hard knocks and abrasion. -- and a W-shaped structure (heels plus bars) that expands sideways when weighted, for shock absorption. -- to have the most possible shock absorption for the leg joints. The REASON we trim hooves is NOT to make them look nice! -- though a healthy, well-trimmed hoof is certainly beautiful. We trim hooves (when the horse does not live and work on the dry, abrasive ground its feet are made for) so that they do not get overgrown, and to help them keep a correct shape and size. -- to keep the toe, which grows forward, backed-up to the correct breakover position, so that the leg has time to fully extend forward and the foot can then land heel-first onto its shock-absorbing heel structures. -- to prevent flaring (stretched white line) at the bottom of the wall, which is painful and leads to mechanical founder. Things to consider in deciding to go barefoot. -- The horse's nutrition, as well as stomach ulcer prevention, including 24 hours available hay or forage, with attention to the amount of sugars in the feed and hay, because many horses become insulin resistant over time (see www.safergrass.org.) High sugar hay, and stomach ulcers, cause damage to the white line (connection between hoof wall and coffin/pedal bone). -- 24 hour turnout, or as much as you can arrange in your boarding situation (see websites on "paddock paradise"). Population density near the cities means that stable properties are getting smaller, so horse owners need to make extra effort to get turnout for their horses. Hooves need continual movement for health and healing. -- Correct and timely care of teeth, using the techniques of modern horse dentistry that balance the jaw and the TMJ (temporo-mandibular joint, where the jaw hinges to the skull). Imbalance in the jaw and TMJ can result in poor back muscling, irregular leg movement, and imbalanced wear of the hooves. -- Correct saddle fit. Pain from a poorly fitting saddle can cause incorrect movement, leading to imbalanced wear of the hooves. We have had excellent results using barefoot to rehabilitate foundered horses to full soundness and rideability (see Founder page). The wild-horse barefoot trim re-balances the navicular foot for healing of inflamed tissues. (see More Topics, Breakover, and Do Trim pages). Due to damage inside the shod hoof, it can take as long as a year after you remove the shoes -- called the "transition year" -- to rebuild internal tissues and grow out a high quality, tough hoof wall that is well attached to the coffin / pedal bone (P3). While this may seem like a long time, if you leave the shoes on, the hoof will not have a chance to heal at all, resulting in the loss of many useful years of life for the horse. Hoof boots are a standard and recommended tool for the transition from shod to barefoot. For the first several months after pulling the shoes, horses should use front hoof boots for riding. Some will need boots during the entire "transition" year, especially those that work on paved or gravel roads, rocky trails, or frozen ground, to protect sensitive internal tissues while they heal. Horses that live on soft footing, or are insulin resistant (IR), may always need hoof boots for riding on rough or hard surfaces. Horses that work on paved roads should use boots on all four feet, to prevent excess wear of their hooves; pavement is very abrasive. Hoof boots are getting better every year. When I started this website in 2000, the only boot available was the original Easy Boot, which was less than an ideal design. In 2014, there are perhaps a dozen very good boots and glue-ons that I know of (including greatly improved Easy Boots), and likely another dozen that I have not heard about. I recommend searching the Internet. Horses that work on soft arena footing can be sore from lack of concussion. They should be walked 10 minutes on a firm surface before and after the arena work to relieve congestion in the hooves. The hoof is "designed" to go on firm ground so that it flexes at every step, causing ample blood supply inside the foot. Many of us live in "horse-unfriendly" climates. If the annual rainfall where you live is more than about 30 inches (75 cm), the ground is too soft for hooves to get sufficient concussion and wear. This means we have to take extra care to help their feet stay healthy, more than for horses that live in "horse-friendly" climates where the rainfall is less and the ground is hard and dry. A shorter time between trims, the quality of the trim, and the use of hoof boots for riding on rocky trails become extremely important in rainy climates or during rainy times of the year. In many areas, if you want a good barefoot trim, you will need to learn to do it yourself. It is not hard to learn to trim. This website has instructions (see Do Trim page), and I also recommend www.ironfreehoof.com. There are barefoot trimmers and hoof schools listed on the websites in my Contact box, above, who can help you learn. -- The toe callus is trimmed away; then the thin sole cannot protect the coffin (pedal, P3) bone. -- The bottom of the wall is left flat on the ground, as in preparing for a shoe. A flat wall encourages flaring in the barefoot hoof. Flares are painful, like pulling your fingernail away from your finger. -- The "pasture trim" often ignores a forward-flared toe, leaving a stretched white line and poor connection to the coffin bone, thus the horse is "sore on gravel" and on rocky trails. --The forward-flared toe causes late breakover and toe-first landing, leading to "navicular" pain and atrophy of the cushioning structures in the back of the foot. -- The heels are left long; overloads the "white line" (laminar tissue that connects wall to bone) in the toe area, leading to the hoof capsule migrating upwards on the bony column of the pastern. -- Frog infection is often ignored; encourages toe-first landing due to frog pain. -- stamina, because the flexing hooves help provide blood circulation to the entire body system. I believe the time is coming when the owners of shod competition horses will have to consider going barefoot in order to remain competitive. Tom Teskey DVM believes we can dramatically improve the performance of "our athletic friends" far beyond what most of us have ever seen. Barefoot care is one small part of a horse-friendly program of care. Tom thinks we will be amazed to discover what horses are capable of, when we learn how to provide them an entirely horse-friendly lifestyle. 1) Learn about their nutritional needs, and the shortcomings of current agricultural practice in raising equine foods. I suggest starting with www.safergrass.org and Pat Coleby's book Natural Horse Care (see below). Feed Your Horse Like a Horse by Juliet Getty is good on overall horse nutrition. 2) Find ways for horses in confined areas to get enough relaxed walking throughout 24 hours. Jaime Jackson's Paddock Paradise: A Guide to Natural Horse Boarding points in a good direction. You can Google several websites with examples of Paddock Paradise set-ups, and there are some YouTube videos. 4) Training approaches can dramatically improve the communication and understanding between horses and humans -- and thereby the horse's performance. There are many people teaching one or another variety of "natural horsemanship," an approach that respects the horse's nature, takes his point of view into account, and teaches ideas in small enough bits that the horse can understand and work with you in partnership. Clicker training adds the principles of operant conditioning to the "horse-respectful" approach, to offer much more precise communication between human and horse. Alexandra Kurland's books and DVD's about clicker training for horses are available at www.theclickercenter.com. I have been using clicker training with my horses for many years, and find the level of understanding and closeness much better than I ever thought we could have. 5) Increasingly, people are using animal communication to solve interspecies "problems." An online book about using this approach with horses is Bobby's Diaries by Jenny Pearce of Australia, available at www.bookswithspirit.com. Bobby was able to explain to his owner how she could do her part of the riding better, so that he could respond better to her signals. Jenny's new book (2008) Zen Connection with Horses goes into detail about how to improve horse-human interactions, building on the horse's reaction of "licking and chewing" (the Chew) to release misunderstandings and old traumas so that he can deal relaxedly with the present situation. There are excellent animal communicators who can help you improve your horse-human relationship as well as with injuries and illnesses. I have consulted with Karen Nowak in Montana, USA, www.freedomreinsllc.com for health and injury situations, as well as for talking with my new horse before I bought her. This section will answer most of the questions people email me about. Why? The horse's foot is built to land on the well-padded frog, similar to the biggest pad on a dog's or cat's foot. Heel-first landing gives correct circulation inside the foot, absorbs concussion to protect the leg joints from shock, and helps remodel deformed hooves. When a horse lands toe-first, or flat-footed, over a long period of time, the laminar tissue ("white line") which holds the hoof wall securely to the coffin (pedal) bone is damaged by the excessive force on the toe wall; forward toe flare (mechanical founder) develops; and "navicular" or other heel pain can result from incorrect movement of the pastern bones. 1) Forward flared toe (see Flares page) causes late breakover, which in turn gives the front leg too little time to fully extend forward for a heel-first landing. (see Breakover page) Even a slight flare delays breakover. If you have been consistently applying a good mustang roll for many months, and the toe wall will not grow down straight, this points to insulin resistance, which becomes more common as horses age, or Cushings, an age-related change in pituitary gland function. b) horse did not go many miles per day as a foal, or currently does not go many miles per day, on firm ground, which toughens the digital cushion. In most domestic horses, especially those that have been shod for a long time, the horse will deliberatelly land toe-first to avoid concussion on the undeveloped digital cushion. The heel should be left 1/8 inch to, in some cases, up to 1/2 inch (2 to 12 mm) longer than the sole in the seat of corn (after any chalky sole material is scraped away), to give some protection to the digital cushion while still allowing frog contact with the ground. Generally the horse will let you know, by increased or decreased lameness, whether you have trimmed the heel to just the length he needs. Horses raised barefoot with sufficient movement, or those in ongoing endurance training, or that live in large enclosures in dry climates, often have tough digital cushions, and their heels can be trimmed (or will naturally wear) down to the level of the sole. If your horse's front feet land toe-first, you need to find the cause and change the situation that is preventing heel-first landing. The hoof must land heel-first consistently to become sound. For all of these conditions, hoof boots should be used for riding (except in soft arena footing) until the hooves are sound and the horse is able to land heel-first consistently. It took me five years to think my way through to going barefoot, before there was any "barefoot movement" to point the way. I completely respect how long it takes to think this through for oneself. I am not in a hurry for anyone to make a decision, I would rather you "do your homework" and take your time. -- I watched farrier Tony Gonzalez teach about balancing hooves, and saw an extremely fidgety horse suddenly become calm after Tony shaved a small amount off the outside toe of one of its feet. The horse stood quietly the rest of the day. -- Becky Tober, a Gonzalez student, showed me how to see many kinds of imbalances in hooves. -- A "pasture trim" on my first horse made me notice that you have to do something different, to ride a barefoot horse. She was very sore, and I put shoes back on her. -- I moved to the east coast in 1998, had the shoes pulled, and started playing with trimming tools. I trimmed my two horses every 3 to 4 weeks for a year and worked my way through all the typical imbalances -- lots of observation, thought, and experimenting. -- While figuring out how to trim, I found Jaime Jackson's first book, The Natural Horse. Later I visited Jaime and saw his awesome set of wild mustang feet; looked at them for hours; took their shape deep into my core. There are photos of those hooves on www.tribeequus.com, and of similar wild hooves on the "Hoof Shape" page of this website. There are photos of another wild horse's feet on www .hoofrehab.com. Click Articles, click Wild Horses, click at bottom "more wild horse pictures," scroll down to "Tragedy in the high desert." -- I heard of Dr. Hiltrud Strasser, a German veterinarian who developed a method for rehabilitating lame horses that includes a barefoot, short-heel trim along with 24-hour turnout and 24-hours available grass hay. I went to a seminar, was inspired by her knowledge of physiology and mechanics of the hoof and leg, and in 2001 took her 9-month Hoofcare Specialist course. -- I found Dr. Strasser's "clinic" trim invasive of the hoof and inappropriate for horses with nearly-normal feet. My horses were unrideable for a year and a half, as were the horses of friends who took the course with me, so I went back to the wild horse trim. I terminated my certification with Dr. Strasser and do not recommend her "clinic" trim, though she has good ideas about "natural boarding" and the general care of lame horses. Since then, there has been a steady flow of information and research, which I have tried to keep up with. Jaime Jackson, a farrier, went out to study the hooves and living habits of the wild mustangs of North America (escaped domestic horses and their feral descendents). Their hooves were far different from anything he had seen in domestic horses; he decided that what he had been doing as a farrier was unnatural and harmful. He changed over to a barefoot trim practice, and found that when he trimmed lame feet to the mustang hoof shape, they would recover, even from severe lamenesses. In The Natural Horse, Jackson describes the lifestyle and hoof shape of horses living wild in their natural environment. The tough, sound, beautiful feet of horses living in wild herds in the western United States are worn to an efficient, short-heeled trim by the many miles they travel every day. The horse is a creature of wide-open, dry plains and mountain slopes (except for the wide-footed breeds of northern Europe, which are adapted to living in soft, wet footing). The horse's native environment includes extremes of heat and cold. The ground is dry, hard, and often rocky. Rivers or water holes are scarce. The wild horse's food is the dry, sparse bunch-grasses of low-rainfall areas, and a variety of herbs, shrubs, roots, and bark. Wild horses walk a daily loop of about 20 miles (30 km.) to find food, water, and other daily needs such as minerals, herbs, shelter from storms, and safe places to sleep. All this walking wears and shapes their feet to perfection. The horse is exactly designed to live well in that environment. Every part of his body, and the social life of the herd, are fashioned for a strenuous life -- and he requires extreme conditions to stay in peak health. Horses have lived this way for millions of years, far longer than human beings have existed. The horse is a successful species -- the design works! The horse's hoof is a masterpiece of living design, built to handle awesome mechanical requirements. We can sustain it by providing what it needs. We can set up "natural boarding" for our horses, to promote their health in captivity, so that they can have an environment similar to what they were designed for. Jaime Jackson's Paddock Paradise explains the key to keeping horses moving -- a long, narrow, continuous loop or "track" which takes them to each of their daily needs in turn. Groups of horses that live on such a walking loop wear their feet enough that they need only minimal trimming. They get much more exercise than horses that stand around in a typical rectangular turnout. When you "go barefoot" with a previously shod horse, your success will depend about equally on arranging for changes in the horse's lifestyle -- especially nutrition and movement -- and on trimming the hooves to the wild-horse shape. It's possible to learn to trim using this website and, if you want, some email conversation. I recommend you get at least one book or video and attend one or more clinics if available; the different points of view will help you fill in the whole picture. You will be "on a fast learning curve" for about a year before you understand the hoof with confidence. Your horse is better off even with your occasional "learning mistakes" than if he were shod. Professional barefoot trimmers are making a good living. Pete Ramey talks about trimming as a business in his book, and see "Going Pro" page. I encourage you to gradually start trimming for others when you have gained about a year's experience with your own horse and feel confident about handling, trimming, and figuring out sorenesses. Please email me if you're thinking about this; I enjoy encouraging people, and can point you towards further training. by Jaime Jackson, available from Star Ridge Publishing, www.star-ridge.com. The Natural Horse Pioneering study of the lifestyle and hooves of free-roaming wild horses; important pictures and data on mustang hooves. Paddock Paradise: A Guide to Natural Horse Boarding Brilliant insight about what keeps wild horses moving. How we can trigger sufficient daily walking in domestic horses to keep their feet healthy. The Natural Trim: Principles and Practice Brings together all that Jaime has learned about hooves, trimming, and lifestyle. Making Natural Hoof Care Work for You How to do a barefoot trim, in Pete's plain language, with clear drawings and photos. Care and Rehabilitation of the Equine Foot Thorough, well-explained, and full of photos. What Pete has learned in 15 years of barefoot trimming and learning. Includes articles by researchers and veterinarians on providing the life conditions that support successful barefooting. Video: "Natural Balance Trimming." How the hoof works mechanically; barefoot trimming; how a toe rocker with early breakover lets the foot land heel-first. Interactive CD: "Hoofworks: Barefoot Basics" Important visual addition to our "basic barefoot library." Available from: www.hoofworksaustralia.com< /il>. / There is a currency exchange calculator on the website. You can also order a packet of five CD's at reduced price, to re-sell. 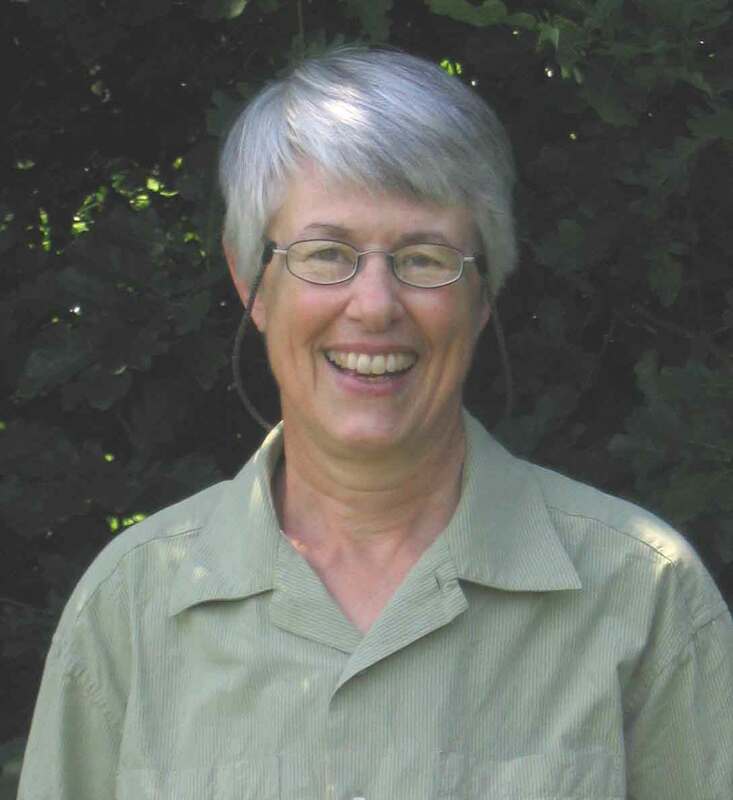 www.ironfreehoof.com is another website about going barefoot, by Paige Poss and Ruth Green. Lots of photos of hooves and trimming. I recommend this as a companion to my website. www.heikebean.com Heike Bean is a brilliant thinker who has trimmed and observed her own horses for many years. This is a good website when you have done some basic trimming and are starting to have more advanced questions. I recommend this as a companion to my website. www.hoofrehab.com Pete Ramey's website. Includes excellent articles that update his first book. www.hopeforsoundness.com Farrier Gene Ovnicek's website. www.tribeequus.com Cindy Sullivan's website. See her discussion "Are you going nuts over flares?" for a discussion of different types of flares and how to deal with them thoughtfully. List of barefoot trimmers. www.thehorseshoof.com Journal about all types of barefoot trimming; frequent articles with new research and techniques. Many articles including a set on frog health. List of barefoot trimmers. www.hoofhelponline.com A teaching website by James and Yvonne Welz who produce The Horse's Hoof journal. http://naturalequinehoofcare. spaces.live.com/ Mule and Donkey feet explained in a gorgeous PowerPoint presentation, by Karen Reeves. www. equethy.com by Chrisann Ware of Australia; article "Why hoof imbalances cause musculo-skeletal problems in horses." www.equinedentistry.com Academy of Equine Dentistry in Idaho, USA. There is new knowledge (far beyond traditional "tooth floating") of how to balance the horse's jaw by addressing the entire bite surface, including the incisors. The horse performs better when there is no pain in the TMJ from an uneven bite. I have had excellent results using this jaw-balancing or whole-mouth dentistry with my own horses. It's the first thing I would get done if I bought a new horse. Any horse that does not graze most of its food over 24 hours, or at least eat hay with its head down, ends up with an unbalanced jaw. www.bitlessbridle.com How the bit prevents the horse from doing his best for you. This site explains why the bit is counterproductive. There are many kinds of bitless headwear; I encourage you to find one that works well for you and your horse. www.safergrass.org Grasses are being bred for high-sugar content, to increase milk production in dairy cows; exactly wrong for horses. Excellent information for grass-laminitis and Cushings horses. (January 2006) Kathryn Watts has two CD's with lecture/presentations given at recent conferences. Natural Horse Care, a book by Pat Coleby, explains how you can improve your horse's health by adding minerals to pasture soils, which are often depleted by conventional farming methods. Gives specifics of which mineral deficiencies cause which illnesses. You will also want to give this excellent book to your hay grower. Available for about $20 from www. acresusa.com phone 1-800-355-5313.
groups.yahoo.com/group/ EquineCushings. Information about Cushings disease. www.softouchnaturalhorsecare.com Phil Morrare explains how to use an angle grinder to trim hooves. He says it takes less strength than hand tools and the horses like it better. Consider in dry climates and for professional women trimmers. http://www.harmanyequine.com/ vaccines.stm Joyce Harman DVM gives a thoughtful overview on whether to use vaccines with horses, and if you do, which ones are most effective and carry the least risk to the horse. She has a new book on saddle fit. www.SwedishHoofSchool.com Ove Lind has worked out, over many years, a hay feeder that helps both fat and thin horses maintain a good weight. The "grandfather" of "slow hay feeders."